Protecting access to an account is a two player game. On one hand, service providers need to use the right tools and techniques. On the other hand, end-users need to have a certain level of awareness about those tools, proper security hygiene, and red flags to look out for. This project aims to help both sides to improve security overall. Goal:Improve security through education, thoughtful UX, and proper technical implementation. Results:All Things Auth, a blog dedicated to improving online security. 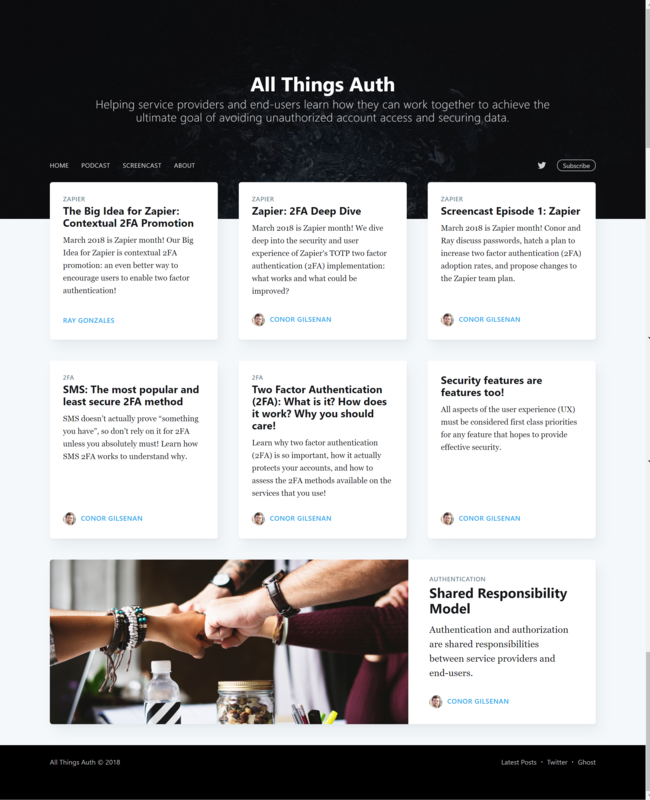 The All Things Auth website, currently using the default template. Effective security can be found at the intersection of UX and technical best practices. Rock solid technical implmentation of security features without a well thought out user experience would be ignored by users, or worse, circumvented. On the other side of the spectrum, a delightful authorization experiences would be worthless without the proper implementation. The aim of this blog series is to help both service providers and end-users to provide better security features through some thoughtful UX, knowledge and best practices. There’s still a lot to do and a lot of ground to cover, but we hope to affect positive change for everyone.